Tucked away on the north-western edge of the South Downs National Park in the pretty Hampshire village of East Meon, lies the unspoilt 2,500 acre Bereleigh Estate. At 600 feet above sea level, the estate offers some stunning panoramic views of the surrounding countryside. From this vantage point, amidst the hawthorn hedges and undulating waves of green fields, you might just spy Cedar Valley – one of the South East's best luxury glamping sites. We say "might", for so snugly guarded amongst the coppice clearings are the Safari tents which comprise the site, they might just escape your notice. This bucolic sylvan hideaway is the ambitious vision of affable owner Jack Tyrwhitt-Drake. Jack's site encompasses four Safari tents – one atop a woodland hill for privacy; 3 in the lower meadow for groups of glampers. There's even a genuine Mongolian yurt for extra accommodation, dining or just a place to get together. Needless to say, all tents are amply-equipped and kitchen and wash facilities are second to none. With an abundance of activities and places of interest in the surrounding area (not least the neighbouring New Forest), and digs the very epitome of posh camping, the call from Cedar Valley is too strong to ignore. Glamping has never been more glamorous. Cedar Valley, situated on the Bereleigh Estate, offers new luxury safari tents, providing a camping experience to remember with adventure and fun for all ages. Our tents open up the possibility of camping to those who may never have considered it before. The tents measure 9m x 5m and are erected onto raised wooden platforms which offer insulation from the ground and they are fully lined. Each tent has three bedrooms, a large double, a twin and a bunk room. There is a well equipped kitchen area with good surfaces for food preparation, a gas hob, a sink with cold running water and a small fridge with the essential ice tray. The rest of the tent is an open plan living and dining area with comfortable seating, a good large table and a wood burning stove. The front opens onto a deck surrounded by a handmade ash fence which creates the perfect setting for those welcome sundowners! We are in an area of Outstanding Natural Beauty, deep in the Hampshire countryside, but within easy reach of both London and the South Coast. We have 3 large grassy field located near Bereleigh House which provides the ideal loaction for campers to come and enjoy. Guests are welcome to explore the field and find the perfect pitch! We believe its a great location and our aim is to have as little impact on the immediate environment as possible. We have however installed a renevated office containers which houses gas showers, basins and proper loos – for your comfort and enjoyment! Children are obviously very welcome and we have designated a mown area where they can play football, fly kites and generally muck around, in total freedom and safety. We like basic, simple and quiet family friendly sites in great locations and this meets the specification. However, £51.50 per night on a May Bank Holiday weekend was a little steep for 3 adults, 2 kids (6 & 3yrs) and a baby considering it's a field with a single converted metal container offering just 2 showers, 3 toilets and 2 sinks (cold running water) which are shared male/female. Even if it hadn't been a BH it would have still cost £40 per night. There is a single outside (un-covered) washing up sink that for some reason was built for hobbits and the grass was in need of cutting as it was ~6" long everywhere. It is a nice site (albeit on a slope) and the facilities whilst basic are adequate the prices need checking. 4 fully-furnished Safari tents, 1 Mongolian yurt, and regular camping with up to 30 pitches in each of the 3 fields. Pets, large groups, weddings, hens, birthdays – yes. Caravans/motorhomes – no. Extra tents accommodated (£10 per night). 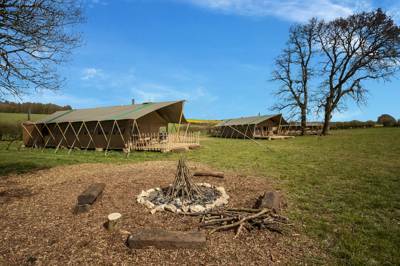 Campers are asked to pitch around the perimetre of each field allow unspoilt views and large play areas for children. The 4 fully-furnished Safari tents sleep 6 each in a large double bed, 2 singles and bunk beds. The Mongolian yurt works as either extra accommodation or a communal gathering and dining space. Each tent has three bedrooms, a well equipped kitchen area, an open plan living and dining area with comfortable seating, a large table and a wood burning stove. Separate bathrooms provide a flushing loo, basin and hot shower. Mountain bikes can be hired onsite and ridden round the estate and further afield. There's a tennis court available for hire by the hour, woodland pony trekking, clay pigeon shooting and excellent walking along the South Downs Way. Try of spot of fly fishing at nearby Meon Springs Fishery (01730 823134) or tee-off from one of the area's three golf-courses at Arlesford, Liphook and Petersfield. For your little glampers, Peppa Pig World (023 8081 4442) is just a short drive away. Each tent has its own fully equipped BBQ area with outdoor seating and a fresh herb garden to make all your delicious meals taste even better. West Meon has a great local butchers in Harriotts (01730 829246). Fridge facilities are provided with each tent plus a large walk-in fridge is available for groups and supermarket deliveries. East and West Meon boast some decent pubs including the Izaak Walton (01730 823252) while The Thomas Lord (01730 829244) and Ye Olde George Inn (01730 823481) offer sophisticated dining options. Mid March – late September. 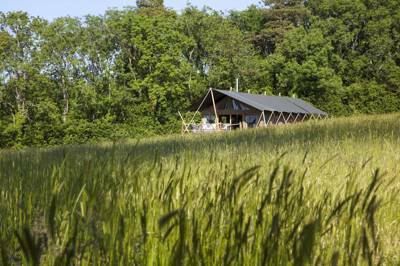 Glamping: £110–£125 a night per tent midweek; £135–£150 a night per tent weekends. Optional linen packages £8 per person (£50 damages deposit). £10 a tent pitch (only available in conjunction with Safari tents booking). 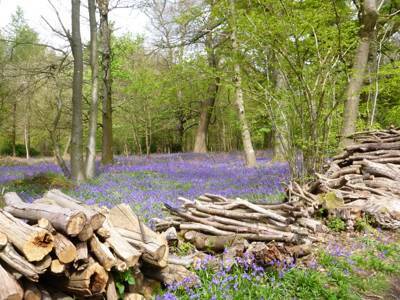 Camping: £5–£10 a night per adult (over 13 years old); £3–£5 a night per child; infants free; £2 per dog. Trains to Petersfield train station and taxi's to the campsite work well.